The boy and girl are playing on the clover-covered meadow with cute animals such as the sheep or the horse. The pear tree beckons with juicy fruits for a little snack in between. Big pieces for toddlers! The bright colors, rounded shapes, and loving details of PLAYMOBIL 1.2.3. help children to develop and to learn through play. 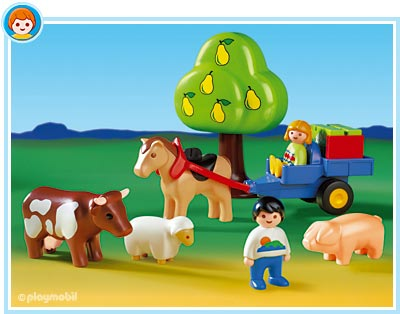 PLAYMOBIL 1.2.3 toys are color fast, easily washable and safe.